Squatters have become increasingly prevalent, particularly in Nevada. People have different ideas of what the term squatter actually means. The common idea of a squatter is either someone trespassing or anyone that the landlord views shouldn’t be in their property. Oftentimes, in the landlord’s eyes, this will include a tenant who hasn’t paid their rent or someone the tenant sublet the property to. Tenants, or anyone who has legally gained entry, whether sanctioned by the landlord or not, do not fall under the rules for squatters. There are other notices to use to start an eviction process for tenants. Another actual definition, though rarely found in practice, is a squatter claiming adverse possession. This situation is when someone finds a property they deem to be abandoned and tries to claim ownership of the property by occupying it. The adverse possession laws require someone to publicly occupy a property for at least five (5) years while either continuously having reason to believe they have the right to the property, or to continually pay the property taxes on the property. However, it is extremely rare for a property to be occupied for over five (5) years without the actual owner noticing, and even rarer for someone other than the owner to pay property taxes on someone’s property without the owner being aware of it. If there is an occupant in your property that has gained entry illegally, they are a squatter. Entry gained illegally is actually breaking into the premises, either by breaking in through a door or actually breaking a window. Another form of illegal entry can be if someone who has never been authorized to live in or rent out the property, gives access to an unauthorized occupant. This can be someone breaking in and letting someone else enter the property. There are recent rules covering these circumstances that make it easier than ever to remove squatters properly. If there has ever been a landlord/tenant relationship with the occupant, squatter rules do not apply. An owner or landlord may not physically remove an occupant or their belongings from the property. By its nature, this is an emotionally charged situation. It is best to avoid reacting in anger and to go through the proper steps. Having a knowledgeable Las Vegas eviction services expert on your side is always the safest route to take when you are unsure of how to proceed with removing a squatter. It is also important to document everything you see and do related to the problem, even if it is just writing down the dates and details of each action you take. The first thing you should do immediately upon discovering a squatter in Las Vegas is to contact the Las Vegas Metropolitan Police Department (LVMPD). Although it is unlikely they will remove the occupant from the property, they can serve to make the process easier for you in the long run. It is dangerous and reckless for an owner to confront a squatter on their own. Additionally, the occupants will be obligated to present identification to the police officer, gaining you the opportunity to get the occupant’s name, which is required for removal. Lastly, it is also possible that the occupant(s) will be arrested at which time you may be able to reclaim your property. In this last example, the only instance in which a landlord or property owner may reclaim the property is if all adult occupants are arrested and all minor occupants are taken into state custody. Then, and only then, the landlord may post a Notice of Retaking Possession and/or Changing of Locks. Within 24-hours of posting this notice, you must complete an Owner’s Statement Regarding Retaking Possession and/or Changing of Locks and file it along with the initial notice of Retaking Possession in Justice Court, in the proper jurisdiction. If you need to remove the squatter(s) there is information you will need in order to do so. The first thing you must have is the actual name of at least one of the squatters. The notice should be addressed to that person and all occupants. You will also need to state when you became aware of the squatter occupying your property and how. For example, you might say, “I discovered the squatters on March 3rd, 2019 when I went to show my unoccupied home to a potential buyer and found it to be occupied by a family I did not know or authorize” or “I discovered the squatters on March 3rd, 2019 when my maintenance crew went to clean my vacated home and found a broken window and people living inside”. This information is intended to show the judge briefly, when it goes for Removal, that the occupant is in fact unauthorized. Once you have obtained this information, the proper notice to do is a 4-day Notice to Surrender. The 4-days are judicial days, not counting the day of service, and allow time for the occupant to respond. If the occupant does respond, it is likely the Justice Court for that jurisdiction will set a hearing which you or someone on your behalf must attend. The occupant may have a compelling reason for being in the property, such as being scammed themselves. The occupant may have a fake lease. Oftentimes, in the case of a lease created by the occupant, it is clear that it is not a standard lease and that the handwriting is theirs and not yours. It is possible the occupant has a legitimate lease given by an unauthorized party. The Judge will make their decision after seeing the evidence and hearing both parties. More often than not, the occupant does not respond and the Judge executes an Order of Removal. 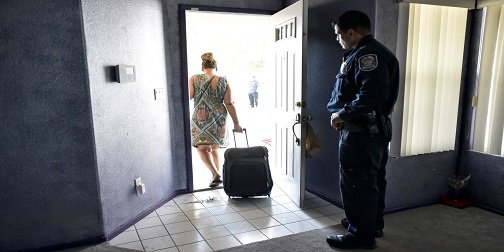 An Order of Removal differs from a Summary Eviction Order in that once the Order is signed, the Deputy Constable is scheduled to remove the occupant without further notice. When the Deputy contacts you to meet them at the property for the Removal of the squatters, be sure to be prepared to change the locks and secure the property. It is also the landlord’s responsibility to properly remove all of the squatter’s abandoned property from the premises after the squatter has been removed. Additionally, it is important to keep the Order of Removal once the Removal is over. That way, if the same people break back in, you can just call Metro stating the occupants have already been removed by the Constable’s Office once, and the Officers will act accordingly.